While it offers the ergonomics and sleek styling that workers want, it also offers the durability, manageability, serviceability and lifecycle management required to achieve an enterprise-worthy total cost of ownership (TCO). The 4.3”, Gorilla Glass 2, 700 NITs, outdoor readable display-works easily in wet and gloved conditions and works well with a fine tip stylus for signature capture. 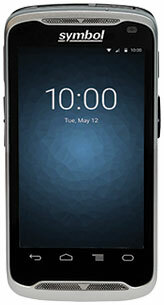 The Android operating system enables the creation of true line-of-business applications with the same graphic-based, highly intuitive UI (user interface) that users are accustomed to on consumer smartphones, while Extensions (Mx) by Motorola Solutions — a set of operating system “add-ons” — turns the standard consumer operating system (OS) into a real enterprise grade OS, with the security and manageability that enterprises require. In addition, advanced technologies take ease of use in the field to the next level. Industrial-class features — including a 1D imager, an 8MP camera optimized for 1D as well as 2D bar code scanning, Near Field Communications (NFC) for card and badge reading and peer-to-peer communications — all provide the advanced data capture required to maximize business process efficiency. For assistance finding the right TC55 for your needs, contact us at Barcode Discount.